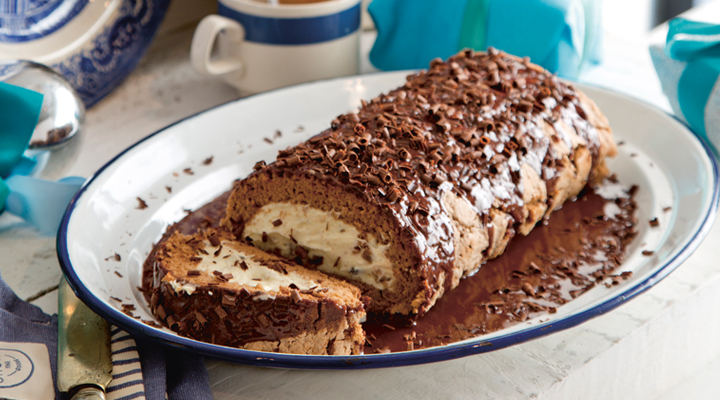 This chocolate roulade can make for the perfect Christmas dessert. 2. Line the base and sides of a 25cm x 30cm baking tray or Swiss roll pan with non-stick baking paper. 3. To make the sponge, melt the chocolate in a heatproof bowl set over a saucepan half-filled with water, ensuring the water doesn’t touch the base of the bowl. Stir until smooth. 4. In a separate bowl, beat the eggs and sugar until light and creamy. Fold in the teaspoon of warm water, then the melted chocolate. 5. Sift the self-raising flour and ground almonds into the mixture and fold in until smooth. Pour the batter into the lined baking tray and bake in the oven for 10 minutes. 6. Place a layer of parchment paper larger than the baking tray on a flat surface. Invert the cake onto the parchment paper and trim any crispy edges. 8. To make the sauce, pour the cream into a saucepan and bring to the boil. Remove from the heat and add the chocolate pieces, stirring until smooth. Add the water and stir to combine. 9. Starting with the long side closest to you and using the paper to help, roll up the cake. Place on a serving platter and pour over the chocolate sauce, then top with some chocolate shavings. Store in the fridge until required.